The Swarovski Z3 4-12X50 BT L is the rifle scope that you need for your long range hunting and shooting sports. It beautifully and simply combines the intricacies of its advanced technology with ease of use in an all-in-one ballistic package. With its reviews currently online, it has an incredible rating. Although the number of reviews online are on the short end, the Z3 series rifle scopes are loved across the board. While it is an older series compared to the newer Z5 and Z6i lines, the Z3 is half the price and still gives shooters the Swarovski service. It was a no-brainer to pick this rifle scope to review for our Swaro line-up. The Z3 series are loved by all shooters and hunters, so I felt compelled to choose one from this line. While the 3-9X and even the 3-10X with the BRX reticles could’ve easily had this review spot, I couldn’t deny the strong tugs the 4-12X50 BT had on my heart strings. The ballistic turret feature is what pushed this one over the finish line and won by a mile long run, hands down. Ballistic turret? This may be the first time you’re hearing about one of these, and I wouldn’t blame you. The following Q&A will have all your questions about this innovative and state-of-the-art technology and any other concerns you may have about the Z3 rifle scope. What is a Ballistic Turret? This is probably the one feature, other than the superb glass, of the Z series rifles scopes that makes them worth every penny. There is a ballistic turret that enables you to set up four different zeros with any given range. You read that right – that’s three extra zeros from your original, say 200 yard, zero. It works by setting predetermined distances with color coded rings – say, 100 yard increments from the original 200 yard zero. After easy set-up, rotating the turret to match the colored dot on the first ring with the white dot on the elevation turret will give you a dead shot at 300 yards. By doing the same with the second ring, you will get another bulls-eye at 400 yards, and so on. Although the ballistic turret technology is nothing new, Swarovski has revived the long distance hunting feature to give you first place shots every time. On a side note, Swarovski is currently the only optics manufacturer that also supplies their own patented ballistic turrets. Other optics manufacturers get their ballistic turrets made from another company. Swarovski is an authority and has an intimate knowledge of every single part and function of their rifle scopes. 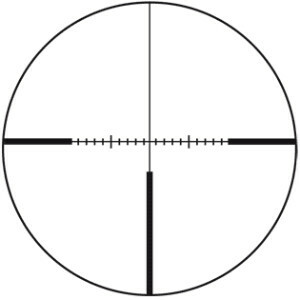 Does the Z3 scope have a ballistic reticle too? The Z3 4-12X50 mm rifle scope with the ballistic turret also comes with two different reticles. The first is the Plex reticle that is your standard duplex style. The second is the 4W reticle that is Swarovski’s windage compensation reticle. There are stadia lines along the windage (horizontal) cross hair in 2 MOA increments that work with the ballistic turret to take all the guess work out of holdover points. In this capacity, it’s a ballistic reticle. But, in the traditional sense – no, because it’s missing elevation markings on the reticle or glass, since this scope has the use of a ballistic turret instead. How do you set up the ballistic turret on the Z3 scope? The ballistic turret on the Z series rifle scopes is an advanced technology that’s extremely easy to use once it’s all been set up. Although the ballistic turret is rather tall and large, perhaps beastly – if you will, it also doubles as the elevation turret to sight in your scope. Using Swarovski’s ballistics program online to input key data about your scope and ammunition, you can get your holdover values for the distances you want. The piece that rotates and turns on top of the elevation turret is known as the coupling. The coupling enables the clicks to be made and is where the three color coded rings that mark your predetermined distances sit. Once you have your original zero, say 200 yards, you use the holdover values or the amount of clicks you need from the ballistics program to set each distance. At this point your original zero should now be marked with the white arrow on the coupling to be in line with the white dot on the turret. Make the first set of clicks and then put the first ring on the coupling where the colored dot lines up with the white dot on the base of the elevation turret. Repeat this step for each distance and each ring. Then turn the entire turret to the original zero in a clockwise rotation. Side note – the turret will always stop at the original zero when rotated in a clockwise direction. Once you’re back at the original zero, put the cap back on with the jutting tab part lined up with the white arrow and the white dot on the turret. Use the supplied tool or coin to screw the cap back on and voila – your ballistic turret is ready for action. How do I use the Z series scope with the Ballistics program? Using the ballistic program online to gain custom holdovers for those long range distances will change the way you experience the hunt. It’s so easy and intuitive. You’ll need to input data such as the scope and ammunition you’re using. Once you’ve chosen your ammo manufacturer, cartridge, and bullet info, the system will automatically calculate bullet weight, muzzle velocity, and bullet coefficient. You then enter in what distance you want your original zero, so it can calculate predetermined distance holdovers for the ballistic turret. And lastly, enter in sea level data for the area you’ll be hunting in. The online system will give you each holdover value from your original zero to set up your ballistic turret. If you want different distances than the ones they gave you, just enter in the new distances you want the holdover values for, hit refresh and you’ve got it. As always with Swarovski, you can expect the best in glass. Fully multi-coated lens provide crystal clear images that are unrivaled in the optics industry. Glass quality is never something to complain about when it comes to their scopes. Even at full power, 12X, there’s no image distortion or blurriness around the edge. Color resolution is always as close to what you see with the naked eye. The 50mm objective diameter lens has a 90 percent light transmission capability, and truthfully, it probably gathers more light than your eye can use, but it’s going to prove its strength in low light conditions. Are there other models in the Z3 line? There are other models, not only in the Z series, but in the Z3 line as well. If it turns out you’re not into the hype of a 50mm lens or even the long range 4-12X zoom, then there’s the 3-9X36 and 3-10X42 rifle scopes. Because the ballistic turret is made for long range hunting where bullet velocity, gravity, and atmospheric conditions play a part in bullet strike and impact, these models don’t have the ballistic turret or the 4W reticle. The 3-9X36 has a couple of standard reticles available and the 3-10X42 has various ballistic reticles available. According to the bull’s-eye, you have no excuse to not hit the inner bull’s-eye with the Swarovski Riflescope Z3 4-12×50 BT L rifle scope. It might not be the flagship line for Swaro, but it sure has swagger of its own. Unfortunately, at 12X power, you won’t have the benefit of having a side focus or adjustable objective since it lacks one. This could just have you taking a look at the Swarovski Z5 3.5-18X44 P rifle scope instead. That beauty of a scope does have a parallax correction side focus, and with 18X max power, you sure will need it at one point or another. Surprisingly, it’s not going to cost an arm and a leg to upgrade to the Z5 from the Z3 scope. That’s a great tip for you since knowing all your options can certainly make all the difference when spending this kind of cash! While the ballistic turrets on the Z3 are hard to beat, the Bushnell Tactical Elite LRHS 3-12X44 rifle scope at least comes in close to the Z3 with its quality features. It has a zero stop, tactical reticle, and parallax correction. However, like the Z3, it doesn’t offer an illuminated reticle. Swarovski is the creme de la creme of optics brands. If there’s one brand we’d want to see in the hands of every hunter, it’s Swarovski. That’s high praise for a well-deserving, world-class brand, and we mean every word!